Have you ever stepped into a space and knew it was sacred? Our friends from San Francisco were here on vacation. 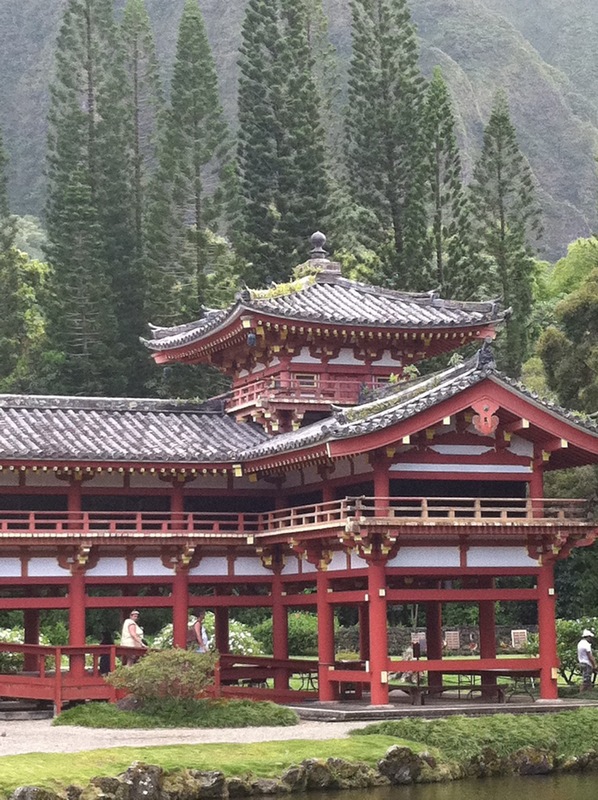 We took them on a drive around the island to show them the sights outside of Waikiki. Our morning started with an unexpected place where friends gathered. At this gathering place, our San Francisco friends ran into old friends of theirs who used to live in the city by the bay. This group filled us with hope for the new day and sent us on our way. We planned to drive straight to the North Shore so our SF friends could see the famous surfing beaches. We stopped along the way which detoured us from the main road we had been on. I’ve known these friends for seven years. I don’t know everything about them and their beliefs, but I do know we believe in the same thing. Miracles. We believe in miracles because we’ve seen them. When he affirmed, I asked our friends if they wanted to see the Valley of the Temples. One of them had heard about it from someone and work. 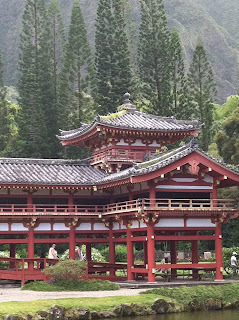 He remarked how he'd never get near the Valley because he had no car during his stay in Waikiki. We have mutual friends who tell us all the time, "there are no coincidences." Excitedly, we turned into the valley. We explained how each cemetery section was divided among all the religions of the island. The drive up the valley is serene, with rolling slopes of grass and flowers marking graves on each side. A cross on the left, a yin/yang symbol and a tiger on stained glass up ahead, a statue of the Virgin Mary on the right. We passed a large family of at least three generations, sitting under a canopy eating and talking near their ancestor’s grave. The road led us to the Shinto section with elaborate black headstones where we made the final turn to the parking area. Halfway across the footbridge, my friend gasped. I took her arm as we crossed to the other side. “Oh, wow!” I heard them both exclaim when they saw the temple. 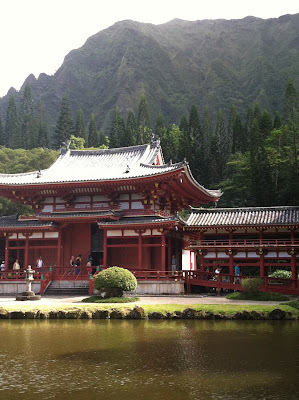 The Byodo-In is a non-denomination Buddhist temple which welcomes people of all faiths. Built without nails, it’s an impressive reddish-orange building which sits at the foot of the stunning cliffs of the Ko’olau mountains. The shadows kept changing the look of the entire setting as the sun shined, then disappeared, and reappeared to create new shadows minutes later. I had been there before with a group of friends and many, many tourists. But Sunday, it was calm and quiet. We made a donation at the large bell and rang it for luck. Then we approached the main building where the large statue of Buddha rests. I slipped off my shoes and with the very first step into the structure, my breath calmed, my shoulders relaxed and all thoughts of things other than the golden Buddha sitting lotus-style in front of me disappeared. Each of us lit incense and stood quietly. Mark took my hand and we bowed our heads in reverence to the calming influence sitting above us. More reason to feel hope in a sacred place.